I had previous managed to clear out all the discrepancies on ITO World's Analysis for Camden, Kensington and Chelsea and the City of Westminster. But I have so far not yet managed to address all of the issues in my home borough Brent. I guess this is mostly because the "issues" are not really in the nicest parts of the borough—perhaps there are even dragons there. 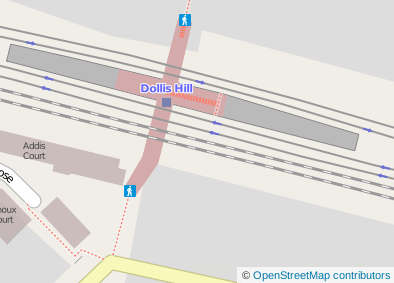 But I am trying to make a point to get to them anyway, so I set out by bus to Dollis Hill to tackle Grunwick Close, Flowers Close and St Andrews Close. The first one, Grunwick Close was a new road and I couldn't find any street sign at all. I had to ask a local resident which indeed confirmed that I had the correct street name. The latter two actually had a "FIXME" tag on them, and no name tag. The first one, Flowers Close, was previously incorrectly mapped as Flower Road (and OS Locator had it right), but the second one was wrong on OS Locator as it had thought there was an apostrophe in "Andrews"—the street sign disagreed. The platform at Dollis Hill had this annoyingly nagging "FIXME" tag on it and I couldn't let that go unfixed of course. (Did I mention OpenStreetMap is addictive and that I have some form of OCD?) So I spend some time mapping all the aspects of the tube station: entrances, tunnels, stairs, platforms, tracks and stop positions—all following the "new" public transport scheme. The image here shows how the new station looks like on the map.